Excel 2010 includes several options for enhancing 3-D charts, such as changing the rotation and perspective, and using 3-D options that format the chart border. These and other related options can be found on the 3-D Rotation and 3-D Format tabs of the Format Chart Area dialog box. After yuo’ve created a three-dimensional chart, select it and then click the 3-D Rotation button in the Background group on the Chart Tools Layout tab. The Format Chart Area dialog box appears. The options you see depend on the chart type. 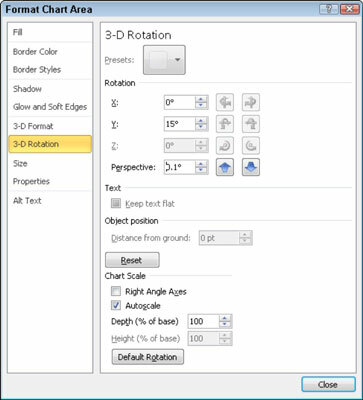 Use the 3-D Rotation settings to rotate a three-dimensional chart. Click the Presets button (if available) to select a built-in rotation or perspective effect. Click the x-axis left or right rotation arrows or enter the degree of left/right rotation (between 0 and 360) you want for the chart in the Rotation box. This rotates the chart area left or right. Click the y-axis up or down rotation arrows or enter the degree of up/down rotation. Click the Perspective up or down arrows to change the “camera” view or the view from the top. Select a Bevel style for the top or bottom of the chart border. Use the Width and Height boxes to change the width or height of the top or bottom edge. Click Close when you’ve adjusted all the settings. The chart appears on-screen, rotated to the angles you selected. A 3-D pie chart before and after enhancement.